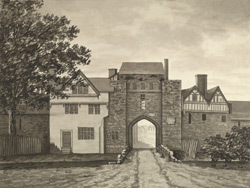 View of Widesmarch gate in the wall around the city of Hereford in western England. Widemarsh gate was one of five gates in the city walls and was the site of a battle during the English Civil War. The Roundheads fired cannon into the gate and breached the defences. The gate was demolished in 1798 as part of a road widening programme to ease traffic congestion in the city.